You will have 36 hours to get as far away from UWE as possible while trying to fundraise money for charity. You can't pay for your transport, so you'll have to use your brains and some ingenuity to hitchhike as far away from Bristol as you can go. 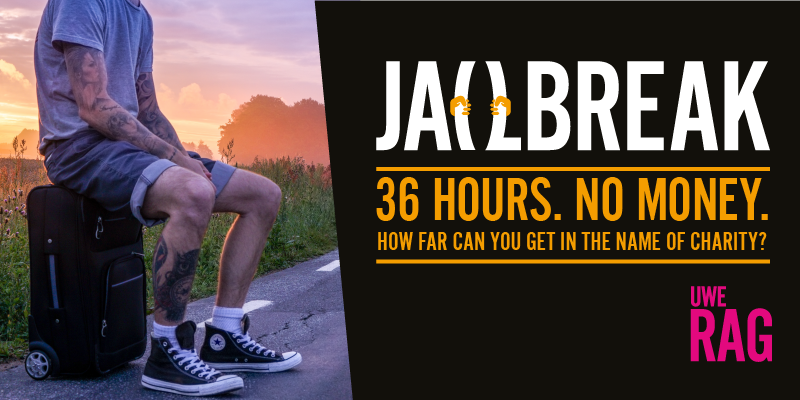 Jailbreak is a chance for you to hitchhike across the world whilst raising money for charity. You have 36 hours to travel as far from UWE as you can, without spending any of your money. This is a team activity so therefore you will need to do it in a group of 2 or 3. What happened at UWE last year? Last year, all our teams made it out of the UK! The winners of Jailbreak 2018 were Team Charlottex2 who won UWE RAG's Jailbreak for the second year running, making it all the way to Cyprus! Our other teams made it to some amazing places including Norway, Barcelona, Lanzarote and Prague. There will be an information meeting on 19 February at 17:00 in 3X108, Frenchay Campus or you can email Rag@uwe.ac.uk for more information.